Meetings: Don’t Just Show Up! Stand Out, Shine, Advance Your Career! Meetings, most of us roll our eyes and can’t wait to get back to our office where the real work gets done. However, meetings, whether they’re regularly scheduled routines in your company or now-and-then get-togethers, can be a place for you to gain positive visibility and to showcase your capabilities. Here are three strategies that will help you stand out, shine and advance your career. 1. Do your homework before the meeting. In order to make intelligent comments, offer helpful suggestions or ask pertinent questions, you need to know a meeting’s purpose and topic areas in advance. If you have received a vague notice or agenda, inquire about what’s going to be discussed and what are the goals. You can basically say that you want to come ready to contribute. If it’s your supervisor or team leader who is calling the staff or group together and has left the focus a bit loose, you might offer to prepare an agenda by saying: “This could save time and help the staff / team come prepared to provide useful input.” Be seen as someone who knows how to make meetings effective. This ability is a real career asset, especially in team-based organizations. 2. Polish your act during the meeting. 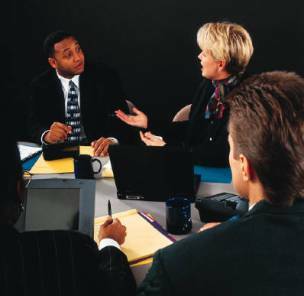 Even if the meeting is informal, mentally run through what issues might come up and what you might say. Jot down any remarks you want to make about certain agenda items. In other words, don’t just wing it. Rather, come prepared with well-thought-through suggestions and supporting information. Here’s where your observations at prior meetings are critical. Do people speak up freely or wait to be called on by the meeting leader? Are presentations made formally, perhaps by standing at a podium or do people stay seated, interjecting comments when there’s an opening? Determine how the most effective members make their points, and how the leader reacts to various presentation styles. Use this information as a model for your presentations. 3. Follow up and follow through after the meeting. What happens after a meeting can be just as important as what takes place during it. Ideas presented must be implemented and decisions carried out. Even as a participant, you can help to ensure that the decisions made become realities. Here’s how. Even if someone else is taking minutes, make brief notes about each agenda item. This is a good way to keep your team and boss informed as well as to be available to prepare a meeting summary and send it out to everyone. Also, if you get a great idea after the meeting, don’t sit on it. The opportunity may be lost. Develop a post meeting proposal or outline and present it to your boss or whoever is in charge. Meeting follow ups can give you great visibility to be seen as a problem solver and leader. If you take an active role before, during, and after meetings, you will demonstrate your ability to get a job done and your willingness to participate in a team effort. As you discover better ways for achieving better meeting results, you’ll be displaying your leadership talent and you’ll be seen as a high performing professional.